Spectra Shot T Shirt 12Ga 3" #2 Shot ( 1 Box ) White Lightning was designed with turkey killing and hunter comfort in mind. 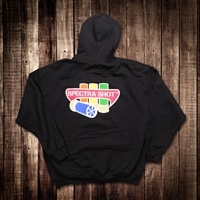 Spectra Shot knows that clean, effective kills are a must. Nickel-plated lead is heavier than lead alone and still economical for use. Black Spectra Shot Hoodie 2 Box Set Of 3" #2 Shot Yellow Shot. White Lightning was designed with turkey killing and hunter comfort in mind. Spectra Shot knows that clean, effective kills are a must. Nickel-plated lead is heavier than lead alone and still economical for use.